These bottle jack-style toe jacks are loaded with many of the same features as our standard bottle jacks, but the toe-lift feature and swiveling pump handle socket make them ideal for machinery lifting and positioning. 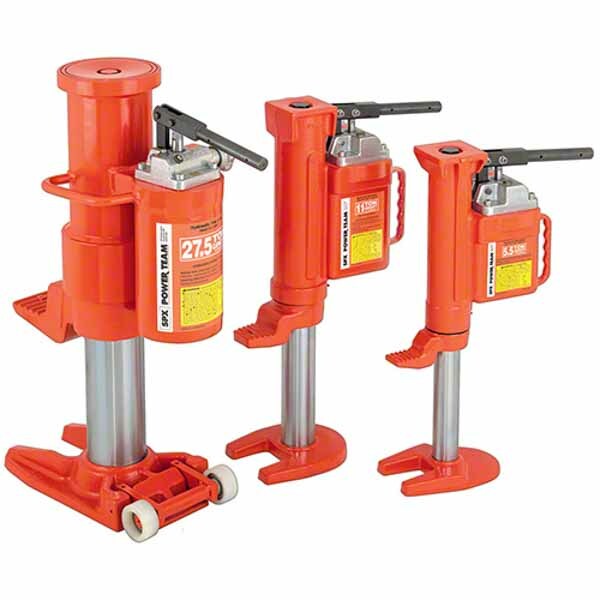 If you’re looking for SPX hydraulic toe jacks to use in your workshop or garage, our range is ideal for machine lifting, rigging, lift truck service and much more. With our range able to lift up to 27.5 tons and have the ability to be operated both horizontally and vertically, you’re sure to find exactly what you’re looking for. Plus, when you buy your SPX hydraulic toe jacks from us, you can trust you’re investing in a quality, long-lasting item as we only stock items from leading brands like Power Team. Here at SGS we have in stock a range of Power Team toe jacks that have many of the same features as a standard SPX bottle jack, but with a useful toe-lift feature and swiveling pump handle socket. This makes them ideal for machinery lifting and positioning. The swiveling pump handle assembly even allows you to access the pump from different positions or in confined spaces. In addition, our SPX toe jacks come with an internal pressure relief that provides added safety by limiting the jack's lifting capability to the capacity of the toe. When you buy your Power Team hydraulic toe jacks with us, you can enjoy free next day delivery, as well as an extended 2-year warranty and a free 60-day returns policy if your toe jack isn’t suitable for any reason. View our full range of SPX toe jacks online today or call us on 01332 576 850 or contact us here if you have any queries.